Pompholyx eczema, also known as dishydrotic or vesicular eczema, shows as, tiny, intensely itchy blisters on the palms and fingers or the toes, instep, sides and soles of the feet. The blisters can break and cause weeping and the skin can then peel as it dries out. 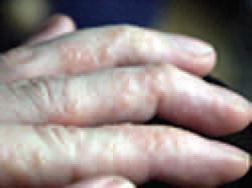 Pompholyx probably affects about 1 in 20 people who have eczema on their hands. It is less common after middle age and in older people. Emotional tension can trigger Pompholyx eczema as can a sensitivity to perfumes and to metal compounds containing nickel, cobalt or chromate. Heat and sweating can aggravate this type of eczema. Treatment is usually by the use of emollients, topical corticosteroids and oral antihistamines. Antibiotics may be prescribed if the area becomes infected. Dermasilk Therapeutic Gloves and Undersocks can help to heal when the skin is broken. Gloves in a Bottle Shielding Lotion will protect against nickel and other irritants. Soaking the hands before bed in a basin of tepid water into which you have sieved a heaped tablespoon of Sea-Med Seaweed Skin Therapy will rehydrate the skin overnight and is highly recommended. *The information AllergyBestBuys provides should not be considered medical advice, nor is it intended to replace consultation with a qualified physician.